I’ve wanted to learn to cable to for a very long time, but have been concentrating on crochet so obsessively for the last 18 months (had you noticed?) that I put it off. I’ve also always felt that my yarn holding technique was inferior because I hold my right needle from above and take my hand off the needle to wrap the yarn. Do you know what I mean? Lately I’ve seen You Tube knitters, John Lewis demonstrators, a Mollie Makes ‘How to knit’ demonstrator on video and a knitting teacher do the same! I learnt to knit when I was a child and found it the easiest method despite Mum telling me it was wrong (she still says I should learn to hold the right needle underneath and wrap the yarn ‘properly’.) Admittedly I do think that my Mum and Gran’s method of holding the needle underneath, sliding the hand along to wrap the yarn in a fluid movement is faster and more efficient but it seems nearly impossible to change an ingrained habit. However the knitting teacher said my method is fine, very common and is called ‘throwing’! My tension looks fine to me, would you know which method was used? Last week I bought the latest Let’s Get Knitting and Crochet mag, which I haven’t bought for a while because I’m subscribed to Mollie Makes and Simply Crochet, but there is a really sweet cabled bag in issue 48. The problem is that you only get very sketchy instructions with LGK&C so I just couldn’t work it out. Last night I learnt to cable with a little help from the book that I heard thud onto the door mat as I typed yesterday: Knitty Gritty. This is my first attempt and you can see I didn’t have an issue with the technique. I’m so surprised! I always thought that cables would be very hard and beyond my skill level. Next I want to master intarsia. Watch this space. What new skill are you determined to master? I also knit like you do! Also have hundreds of people telling me and showing me faster methods! But like you I still wrap around, thats how we roll (knit) heehee! Love your cable! Well done! Thanks for the compliment! Always nice to hear from you. I bet it can be very frustrating for the designers sometimes. I realise that the publishers need to get a balance between pages of instructions and a variety of patterns, but it can be frustrating when you can’t work out how to do something. There’s an owl cushion I’d love to make but I tried and just can’t get to grips with the twisting and colour changes of intarsia it requires (also in issue 48.) I need to find a good intermediate book for techniques beyond ribs, moss st etc. If you have any suggestions please? Very neat, I’m impressed. Do you think the practice we get at reading crochet patterns with the CAL has helped your knitting pattern reading too?? 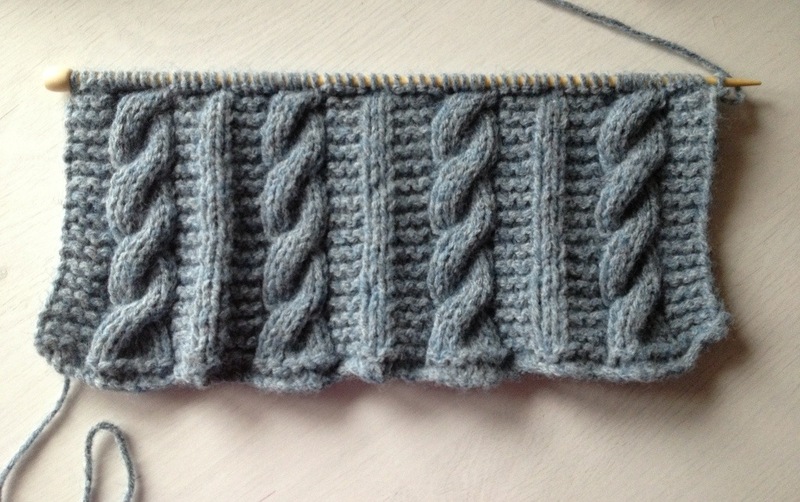 Have no idea how I knit as it is sooooo long since I did, but to use my Dads terminology…. It’s probably cack handed! I was thinking the same re: reading patterns. I def understand the bracketed instructions thing now. I let go of the needle when I wrap the yarn, too. You’re right — it’s hard to change after learning that way! 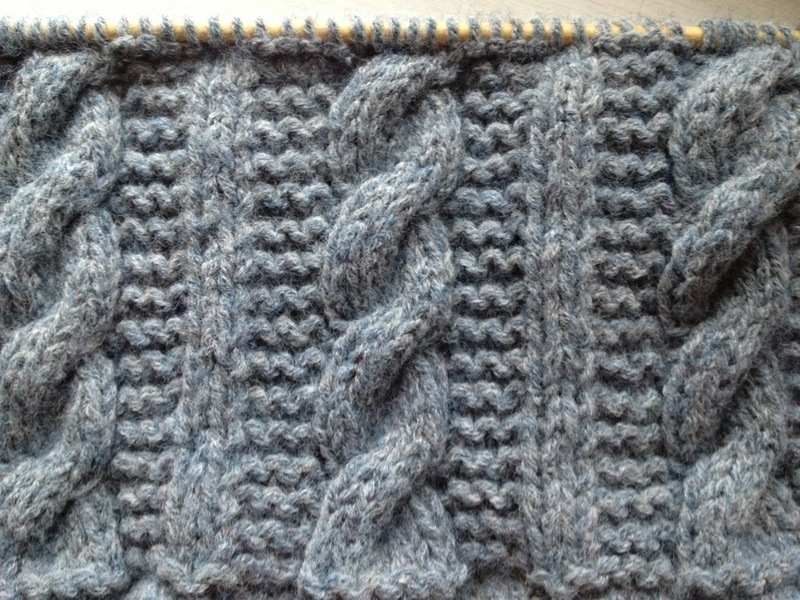 Your cables look like you’ve been doing them for ages, and I have a feeling intarsia will be as easy once you get going. I throw my yarn exactly the same way you do and also thought my way was inferior. So much so, that stopped me from participating in Knit In Public events and pretty much anything that would have me knit outside my house. :D I got over that recently and guess what, cables are next up and intarsia’s my technique to learn in March! Glad to know that I’m in good company. That’s good. What made you get over your reluctance? It looks good! 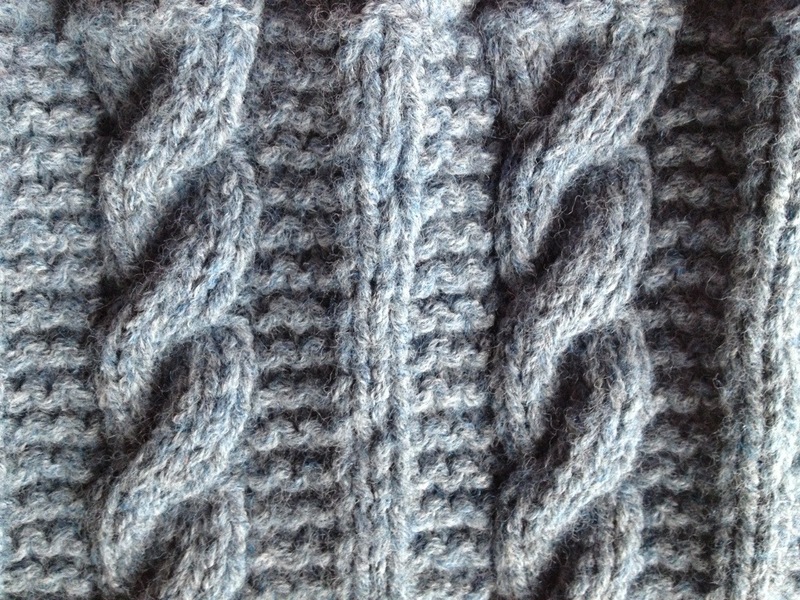 I don’t knit so I’ve no idea about cabling, but it looks tricky, I’m impressed! I used to throw the yarn, just like you! A friend showed me the ‘under the needle’ method and after a lot of practice I mastered it and I do it automatically now. However, does it matter, even if it is quicker? The only reason I rush to finish a piece is to start on a delicious new lot of yarn! I REALLY want to learn to crochet but it is just beyond me. I have tried to do squares so many times and been shown so often but its all double dutch to me. I think speed and efficiency probably do matter, at least to me, as why waste time and energy when you can be more effective in method? But I’m pretty fast throwing the yarn I guess. Partly it’s perfectionism, wanting to use the best method for the task and feeling a bit inept. Good or bad this is it. 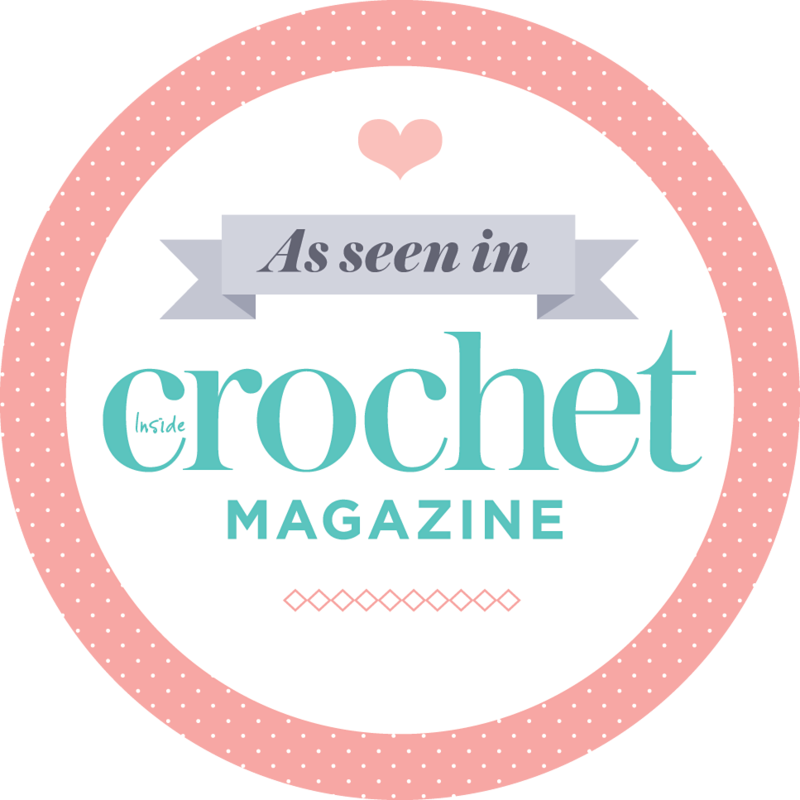 Please please buy the crochet book listed at the side here called Crochet Unravelled. I guarantee you’ll get to grips with it. It’s about £6.50 and FAB. I couldn’t have learnt without it and I tried lots. GS are not the things to start with either, don’t run before you can walk. That’s lovely work, and for a first attempt its super-lovely. I just cannot get the tension right with cables, mine always look gappy on one side and pinched on the other. I’m a ‘thrower’ too. I find the Continental method a bit loose.